A very tasty, healthy and quick meal, perfect for an evening when you don’t have much time in the kitchen but still want to have a nice meal. And despite its being so quick, it still looks good enough to serve it on a more formal occasion. 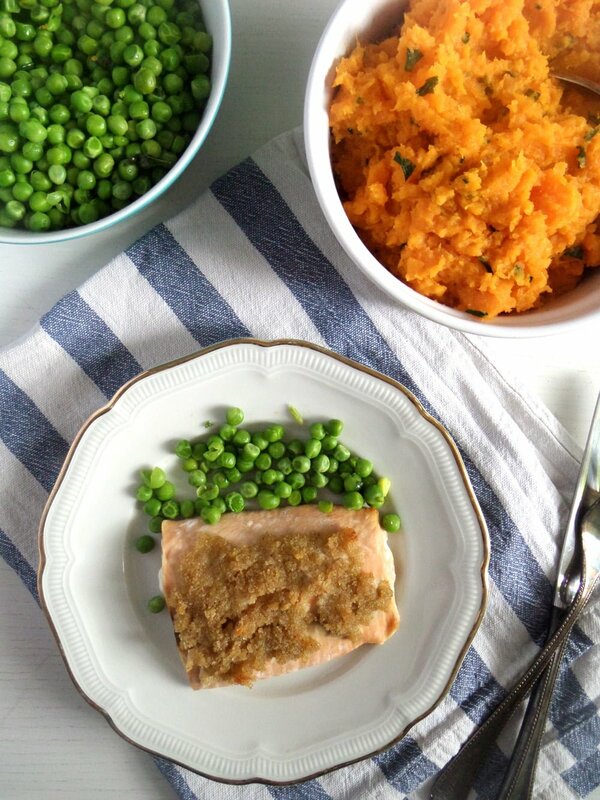 I just love the color combination: pink salmon with a golden crust, brightly green minted peas and orange sweet potatoes. Preheat the oven to 200 degrees Celsius/ 390 degrees Fahrenheit. Bring a pot of water to a boil, add the peeled and chopped sweet potatoes and some salt. Bring to a boil again and cook until soft. Bring another pan of water to a boil, add the peas and some salt and cook until the peas are done. Meanwhile wash and dry the salmon filets and place them in a lightly buttered baking tin. Mix the zest of the lime, 2 tablespoons butter, the roughly ground pepper and the breadcrumbs together. Divide this mixture between the 4 salmon filets and press it down on each piece. Cut the lime into wedges and arrange the wedges in the tin between the fish filets. 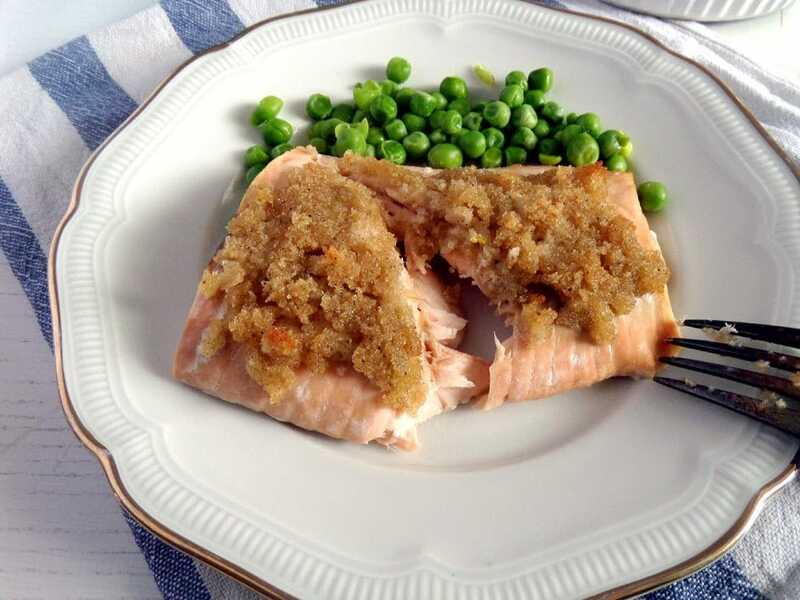 Bake the salmon for 8 to 10 minutes until the breadcrumb mixture turns golden and the fish is cooked through. Be careful not to overcook the fish. While the fish is in the oven drain the sweet potatoes, give them back to the pan, add one extra knob of butter and crush them lightly. They should not become mashed potatoes. Adjust the taste with salt and pepper and stir in some chopped fresh thyme if you like. Drain the peas, refresh under cold water, place them in a warm serving bowl, add some chopped mint and the second butter knob. Add salt and pepper to taste. What a great looking salmon. Perfectly cooked and flaky, just as I like it. Great job! 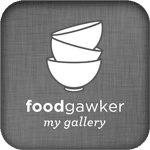 With your recipes you give me a lot of inspirations, Adina.I’ve already prepared some of your fatastic recipes, and my familiy were always exited♥.Thank you so much!! What a beautiful meal! So much color and textures. 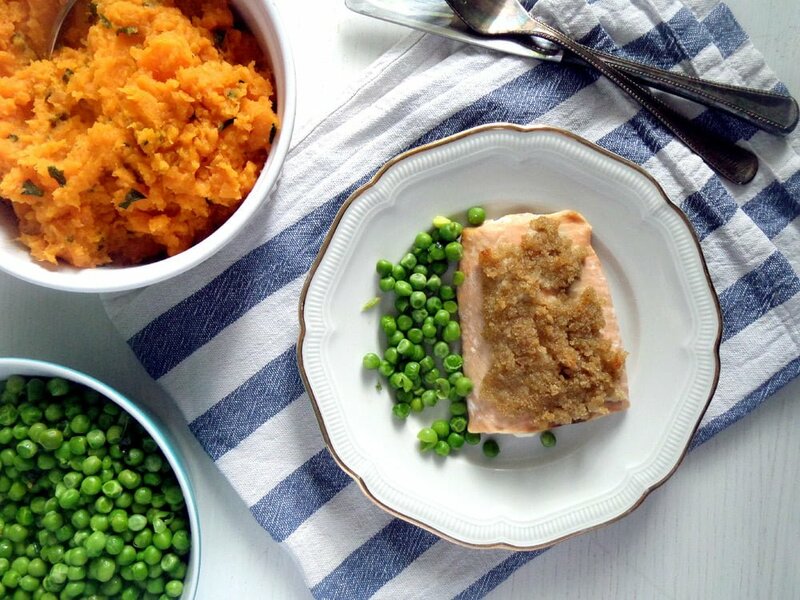 Your salmon with the lime crust looks simply delicious! Thank you. 🙂 I love the colors too!